A Local Area Network is a network confined to one building or site. Often a LAN is a private network belonging to an organisation or business. Because LANs are geographically small, they usually use cables or low-power radio (wireless) for the connections. A wireless LAN (WLAN) is a LAN that uses radio signals (WiFi) to connect computers instead of cables. It is much more convenient to use wireless connections instead of running long wires all over a building. However, WLANs are more difficult to make secure since other people can also try to connect to the wireless network. So, it is very important to have a good, hard-to-guess password for the WLAN connections. A Wide Area Network is a network that extends over a large area. 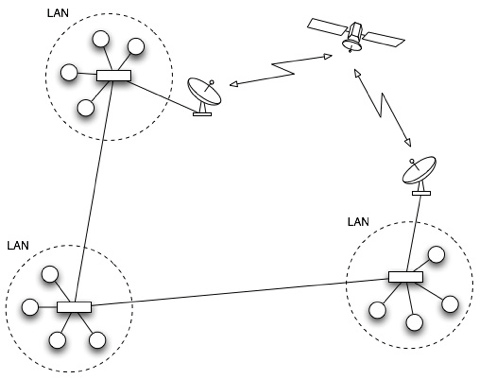 A WAN is often created by joining several LANs together, such as when a business that has offices in different countries links the office LANs together. 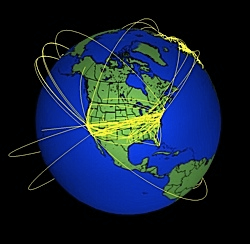 Because WANs are often geographically spread over large areas andlinks between computers are over long distances, they often use quite exotic connections technologies: optical fibre (glass) cables, satelliteradio links, microwave radio links, etc. The Internet is an example of aglobal WAN .In fact it is the world’s largest WAN. Computers on the International Space Station are linked to the Internet, so the you could say the the Internet is now the first off-planet WAN! Bluetooth is a wireless networking technology designed for very short-range connections (typically just a few metres). The idea of Bluetooth is to get rid of the need for all of those cables (e.g. USB cables) that connect our computer to peripheral devices such as printers, mice, keyboards, etc.